David Kronheim of numbertamer.com has put out his annual analysis of minor league baseball attendance, and it’s got some illuminating tidbits among its 80 pages. You can download the full report at his site, but I scanned through it last night for some of the locally relevant figures. The Lakewood BlueClaws were one of two Class A teams to average more than 6,000 fans per game in 2012. The Claws’ 6,031 over 68 home dates trailed only the high-Class A Dayton Dragons, who drew 8,532 for 69 dates and have sold out every game in their 13-year history. Dayton’s run of 913 consecutive sellouts — including postseason contests and an all-star game, and counting — is the longest sellout streak in North American sports history, according to Kronheim. Lakewood had the ninth-highest increase in all of minor league baseball from 2011 to 2012, with 28,043 more fans last season for a 2012 total of 410,113. The increase was mostly a result of nine games in 2011 lost because of weather; the 2012 season saw seven more home dates than the previous summer. Lakewood was one of three Phillies affiliates to lead its league. Clearwater (177,297) led the Florida State League and Lehigh Valley (622,421) led the International League. Lakewood led the South Atlantic League in both total and average per game and topped 400,000 for the 11th time in its 12 years (those nine 2011 rainouts resulting in the only blip). The BlueClaws have led the Sally League in total attendance 10 of their 12 years, and in those other two years, they led in per-game average (more than 6,000 every year). Lakewood’s inaugural season in 2001 drew 482,206, still a South Atlantic League — and New Jersey — record. That was a “14-fold increase“ (emphasis Kronheim’s) over the 32,641 that the franchise drew in 2000, its final season in Fayetteville, N.C. Those Cape Fear Crocs drew just 32,641. In his analysis of minor league baseball in Major League markets, Kronheim put Lakewood in the New York market, which the BlueClaws led. The independent Long Island Ducks were second with 377,473 on 68 dates, followed by the Somerset Patriots (350,295 for 66 dates). Kronheim places Trenton in the Philadelphia market, where it ranked third with 373,355 fans over 69 dates. Lehigh Valley led, followed by the Reading Phillies (426,623 in 67 dates). The independent Atlantic League’s Camden RiverSharks drew 231,987 in its 67 dates. Trenton set a Double-A record of drawing more than 400,000 fans in 14 consecutive seasons from 1995-2008, but Reading broke it last season with its 15th straight such season. Trenton’s all-time high of 457,344 was set in 1998. Of the 12 current Eastern League cities, only Binghamton (259,183 in 1992) and Bowie (463,976 in 1995) have older highs. Akron’s record high of 522,459 came in 1999, but every other Eastern League franchise has set its high after 2000. The most recent were Harrisburg (294,325), New Britain (368,523) and Richmond (463,842 — its Double-A high), all in 2010. An Atlantic League team has led all independent teams in attendance since 1998: Bridgeport (1998-99), Long Island (2000-11) and Sugar Land (2012). Last year was Long Island’s first year outside the top spot in its history and its 377,473 was an all-time low — but still pretty impressive. 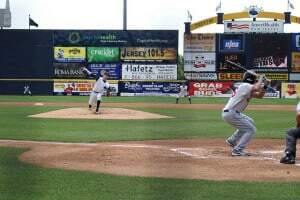 The Somerset Patriots’ 350,295 was 21,787 fewer fans than in 2011 — the fifth-largest dropoff among independent teams — but that was due in large part to five fewer home dates because of weather. The Patriots still averaged 5,308 in 66 dates and have topped 5,000 per game in every year of their existence (posting a franchise-best 376,315 in 2004). Adding the five lost dates at just 5,000 per would have erased the dropoff from 2011 and neared the 2004 high. (But such figures can’t be assumed. If the lost dates were in April or May, for example, the Patriots might not have drawn 5,000 on a chilly, rainy school night.) Their season total was still third among all independent teams, and they’ve topped 335,000 in all 14 years of operation. The Camden RiverSharks’ 231,987 in 67 dates marked another decline, down 12,241 from 2011. It’s the team’s lowest total in its 12-year history — but it’s still drawn at least 230,000 every year. Camden’s high of 313,792 came in 2002. The New Jersey Jackals’ season total of 87,206 marked the club’s first increase since 2007. Over 46 home dates, that averages out to 1,896. They drew 84,865 to Yogi Berra Stadium in 2011, meaning an increase of 2,341 last year. The Jackals’ high of 129,179 came in 1999. In 2010, the Bears’ last season in the Atlantic League, they drew 117,985 (with a longer schedule). Their modern high was 243,255 in 2001 — an average of 3,525 per game. The city’s all-time high was 342,001 in 1932, when they were an International League affiliate of the Yankees. The original Bears’ final season in 1949 drew a total of 88,170, which remains the International League’s all-time low. The Can-Am League’s total attendance fell 132,415 (21.1 percent) in 2012 compared to 2011, but that’s a reflection of the loss of three teams. Average per date was up 237, to 2,087. Lehigh Valley IronPigs: Led all U.S./Canadian teams with 622,421 and 9,153 per game … The IronPigs were the visiting team in their home ballpark eight times in 2012, because the Scranton-Wilkes Barre Yankees played all their games in other teams’ ballparks. Officially those attendance figures were credited to Scranton, but if they were added to Lehigh Valley’s total, Coca Cola Park drew 688,821 fans in 2012 … The IronPigs have led the minors in average attendance the past three seasons and in overall attendance the past two … They’ve had 290 sellouts since 2008 … In 2011, the Phillies led Major League Baseball in attendance, and coupled with Lehigh Valley leading all of minor league baseball, it marked the first time that a team led the Majors in attendance and had one of its affiliates lead the minors in the same year. (The 1931 and ’32 Yankees led the American League, while their Newark affiliate led the minors.) … Lehigh Valley is the only team to top 600,000 total fans in each of the past five seasons … Coca Cola Park’s 8,089 seats put it among the smallest in Triple-A, but the IronPigs have exceeded capacity 290 times and topped 10,000 93 times with standing room and lawn seating. Brooklyn Cyclones: The Coney Island crew had the highest attendance among short-season squads for the 12th year in a row — 249,009 … The Cyclones’ 6,553 per game also led all short-season clubs for the 12th straight season … Brooklyn ranked fourth in the New York market (behind Lakewood, Long Island and Somerset — all in full-season leagues) and outdrew full- or longer-season clubs in Bridgeport, Newark, Montclair and Rockland County, N.Y. … Brooklyn had 38 home dates, while Bridgeport had 65, Newark had 48 and the New Jersey Jackals had 46. The Cyclones outdrew the Bluefish by 116,870, Bears by 216,953 and Jackals by 161,803. No wonder the Mets wouldn’t let Scranton-Wilkes Barre play home games in Newark. … The Cyclones have 12 of the 16 highest single-season totals in short-season history (Aberdeen, Md., and Portland, Ore., each have two). Their all-time high — and a short-season best — of 317,124 came in 2002, their second season. … Last season’s total was up over 2011’s all-time low of 245,087 … With their 38 home dates, the Cyclones outdrew 46 of 60 full-season Class A teams, 10 of 30 Double-A clubs, 12 of 16 Mexican League teams and the Triple-A Tucson Padres … Brooklyn’s 6,553 per game bested all but one Class A team (Dayton), one Double-A club (Frisco, Texas), two Mexican League teams (Monterrey and Saltillo) and Sugar Land. The Cyclones’ average also ranked higher than 16 of the 30 Triple-A squads. Staten Island Yankees: Things aren’t as sunny across the bay. The Yanks drew 141,163 and had the largest loss from 2011 to ’12 among short-season clubs, drawing 51,405 fewer fans, or 1,949 fewer per game (the largest per-game loss of any affiliated team) — and with four more games (38) on the 2012 schedule than they had in 2011, because of weather … Staten Island’s total loss ranked eighth among all clubs, behind four Mexican League teams, Double-A Mobile, Triple-A Pawtucket and Double-A Birmingham … The Yankees did outdraw Bridgeport in the New York market, but trailed Hudson Valley and Rockland County … Staten Island’s all-time high (209,018) occurred only in 2010, a steep decline in just two years. Other notes from the region: The Hudson Valley Renegades drew 12,568 more in 2012 than in ’11, the best increase among short-season teams. The Renegades topped 4,000 per game for the 19th year in a row — all in a ballpark with a capacity of 4,494. They’ve drawn at least 138,000 every year since they were born in ’94. … The Reading Phillies drew 6,368 per game, one of three Double-A teams to average more than 6,000 (Frisco and Richmond were the others). Playing in the same ballpark as in 1982, the R-Phils drew 344,748 more than they did 30 years ago, the biggest gain among Double-A clubs in that time. And yet, Reading saw a 30,334 decline from 2011-12, the biggest drop in the Eastern League. … The Binghamton Mets drew 259,183 in their first season in 1992, but haven’t topped 250,000 since. The B-Mets’ 196,929 last year was 12,115 fewer than in ’11 (209,044). … And one historical note: In 1977-78, the Jersey City Indians (with Rickey Henderson in ’78) drew just 88,993 combined those two years.